An organizing meeting was held, and, building and expanding on the model pioneered in Chicago, the Cincinnati fair established an ambitious and successful model that was effected there and in other parts of the country. Cincinnati’s Sanitary Fair was considered the true beginning of the Sanitary Fairs, which raised over $5 million in a little more than a year. 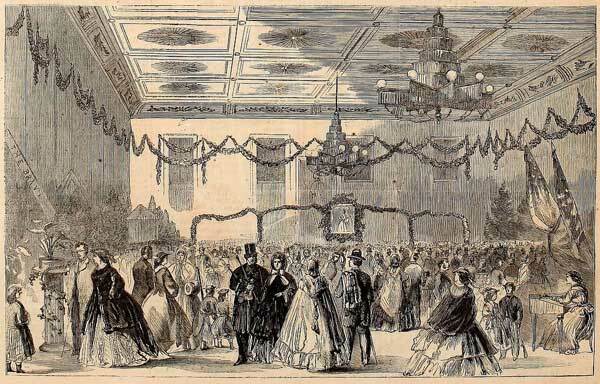 A scene from the Great Western Sanitary Fair in Cincinnati on December 21, 1863. Image courtesy Harper’s Weekly. Women of the War, by Frank Moore (1866), pp. 576-79.